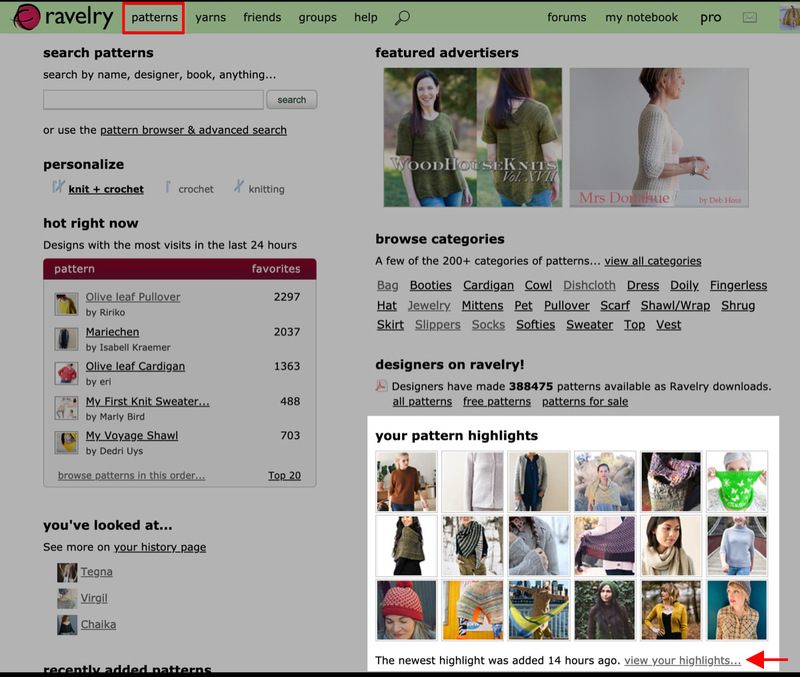 If you have looked for help in the Ravelry forums, there’s a good chance you found it thanks to Joan Schrouder, or schrouderknits. 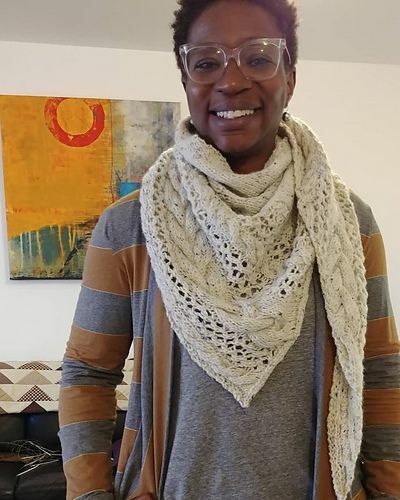 A master teacher, both on- and offline, she has dedicated countless hours to helping people gain confidence in their craft, learn new techniques, and make beautiful things with yarn. She taught for over twenty years at conventions, shops, and guilds and even cruises, and has shared her expertise online since the mid 1990s. 11,910 of her forum posts have been marked as educational by at least one other Raveler (which is a HUGE number). 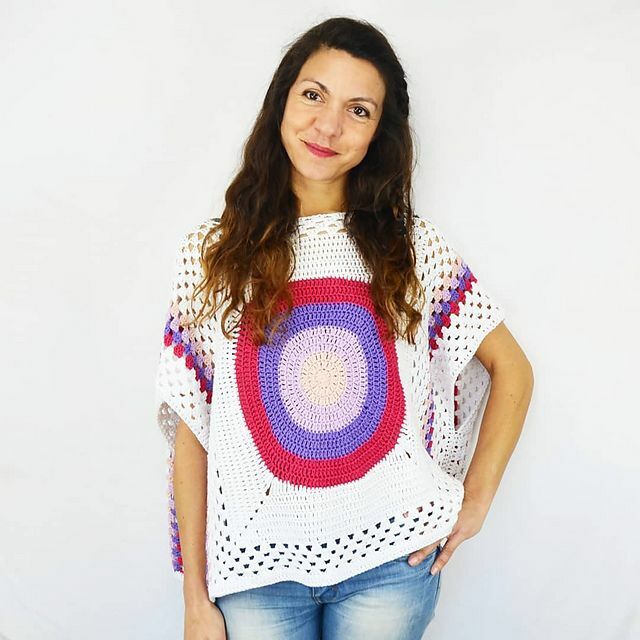 Some of her posts that made many Ravelers click that educational button share tips for making center-pull yarn balls, working slipped-stitch selvedges with stripes, mending family heirloom afghans, and fixing miscrossed cables, just to point out a few of her nearly 70,000 helpful and informative posts! Ravelers, you have spoken… and you asked to learn more about Joan! Other requests I received made it clear: so many of us are grateful for Joan’s helpful presence on Ravelry, and would love to know more about her. We are thankful she agreed to be featured here! “Ever since I got a modem for the internet in ’96 and joined the old KnitList, I’ve enjoyed making suggestions for solving knitting problems. I like the mental stimulation of seeing if I can read between the lines sometimes to figure out what the actual problem is, and then finding a solution and being able to adequately describe it. At first it also helped promote my teaching; I know that a number of gigs I got were as a result of someone being familiar with my posts and thinking I would be a good candidate for giving a workshop in their area. Without further ado, here are our five questions for this wonderful Human of Ravelry, schrouderknits Joan! How, when, and why did you learn how to knit? I learned to crochet when I was still six, staying with my grandmother who taught me when one of my brothers was born, and mom farmed the rest of us kids to relatives for that first week she was home. About two years later I was taught to knit at about age eight by a classmate on the bus ride to and from school. Her mother was an Australian war bride so I learned English style first. My friend Marri only know how to do the knit stitch so that’s all I knew until a couple of years later when a childhood friend of my mom’s was visiting and showed me. Somewhere in all of this, a neighbor showed me how to knit continental as I had a death grip on the yarn with my right hand and could barely move stitches. Continental proved more effective for me and also more comfortable, since I had already learned to tension yarn in my left hand from crocheting. My first stitch pattern I learned was what I later learned was brioche, so it involved YOs. I did them as I had learned in crochet, which was wrapping the opposite way as they’re usually done in knitting. I recognized this, and instead of converting the YO direction, I switched all my knitting and purling stitches to the same clockwise wrap direction to match. 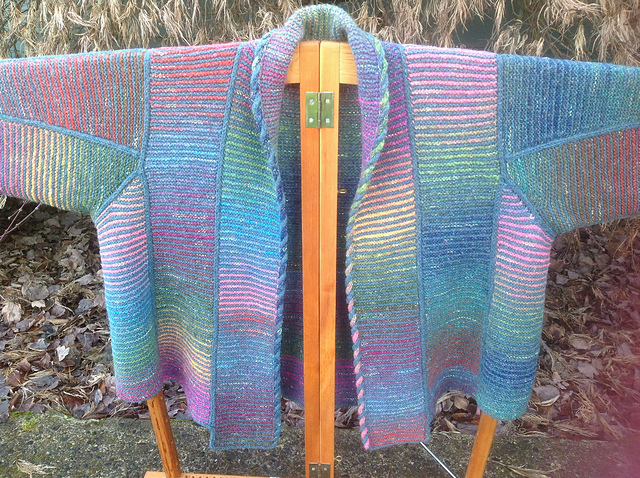 The first full project I knit was a sweater, a cardigan in two-color brioche, or at least my version of brioche, which I designed myself at about age 14. 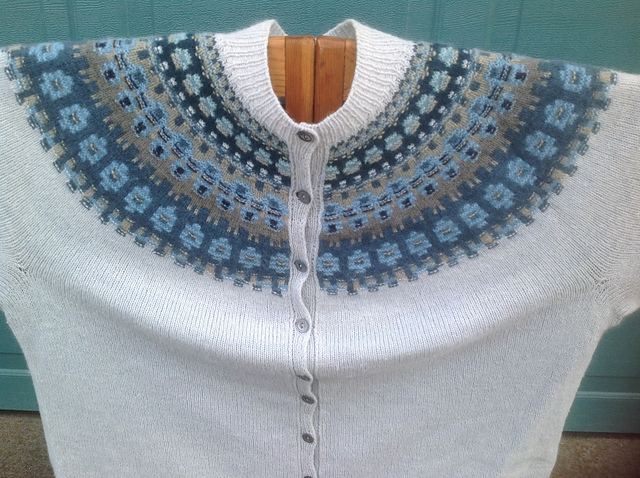 I wore it, and another pullover version of the same stitch throughout high school. I didn’t know how to read patterns then, so I had to design it. What hobby (or hobbies?) outside of knitting/crochet do you enjoy? Knitting is pretty much it. I watch TV programs I’ve recorded while knitting (love the British murder mysteries!). I used to read more but eyestrain prevents longer binges for that. Joan’s notes: Note that the diamond motifs get smaller to taper the sleeves which I had to work out. The neckline shaping is integrated with the diamond motifs and the shoulders were BO and grafted over the BO to give the illusion of being seamless, but with the structure of the BO to help support the sleeve wt. What’s one way that crafting has changed your life for the better? OMG, what a life-changer it has been! 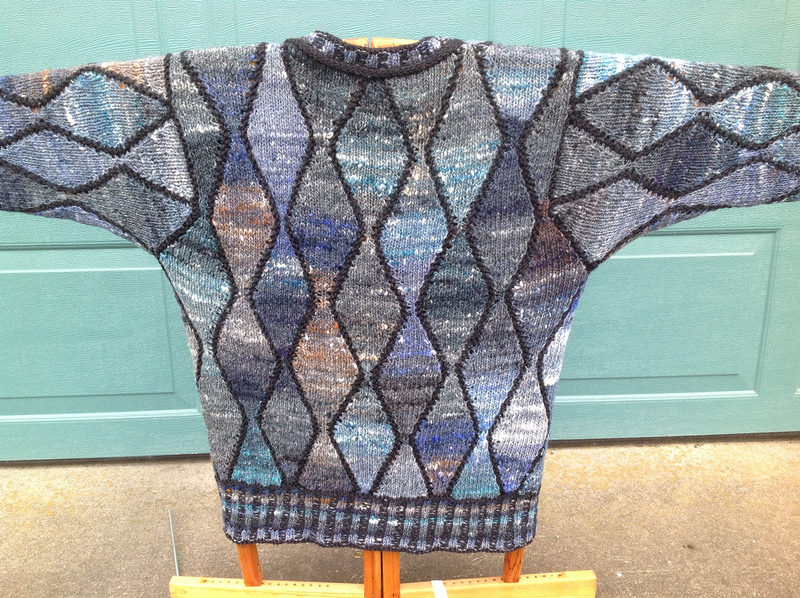 I found Elizabeth Zimmmermann’s Knitting Without Tears in 1974 and it answered so many questions I had about construction details, so my knitting know-how jumped to warp speed. 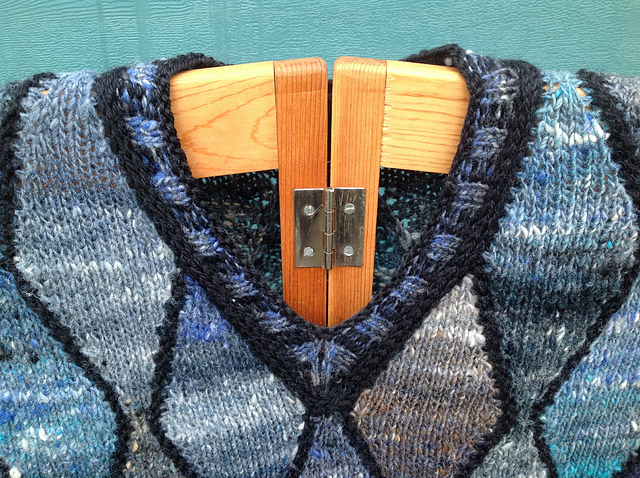 About five years later I read an article in a knitting magazine written by someone who’d attended her Knitting Camp in Wisconsin, and that did it for me – I HAD to go! I had never flown anywhere by myself and had two young children at home, but DH said, sure, go ahead, and I did! It was the start of attending ~20 Camps over the following years, half of which were while Elizabeth was still teaching them, then the other half where her daughter Meg Swansen took over. Through those yearly jaunts, I continued being more adventuresome in my knitting, inspired by the beautiful things that Elizabeth and Meg did, plus all the wonder projects shown at “show & tell” by fellow Campers. It also began a network of others who were/had gotten into selling designs to magazines and yarn companies. One year the editor and publisher from KNITTERS magazine came, so I got to show them a design and they invited me to submit it for publication. Another attendee kept goading me into submitting teaching proposals to TKGA for their annual conventions, so I finally did that, and was accepted. One gig led to another and pretty soon I was teaching all across the US and into Canada at major knitting shows and conferences, and from that soon got invitations to teach for guilds and LYSs, and on cruises and even a couple of train trips in the Canadian Rockies, which I did for more than 20 years. I taught my last class in 2012 as I was ready to retire from the hubbub of travel. I miss meeting new people and see old friends, those designers and teachers who also frequented the same teaching circuit. I miss having the opportunity to go to museums and see the beautiful sites around the country and beyond on these trips as many hosts were gracious enough to offer their time as tour guides to their particular cities. What sustains your enthusiasm for crafting? Interesting question – I think it’s that there’s always something new to learn or try, that with knitting there’s never an end point at which nothing new will ever happen. People are just so darn creative and inquisitive to find other uses for some of the old stand-byes as well as come up with a totally novel approach. What is your favorite yarn trick or hack? 2 Sleeves = circumference of upper sleeve + circumference of wrist, then multiply that total by the sleeve length. So this tells me whether my sweater needs to be a shorter length, or if I don’t want to do that, then start thinking about what kind of color patt work to put into the yoke or instead think about a vest if I don’t have enough yarn to make sleeves. 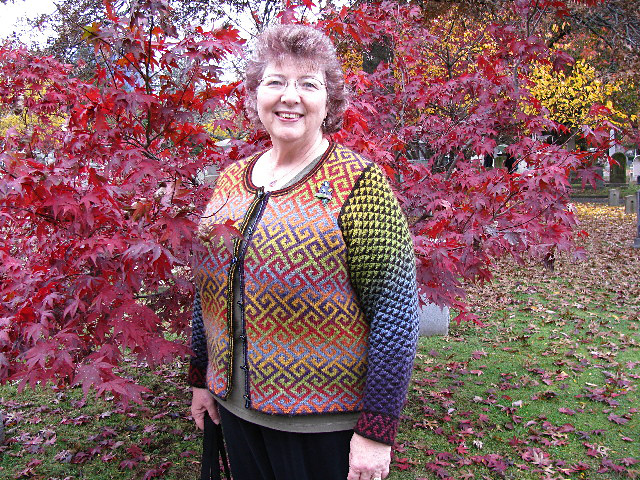 We are so fortunate and thankful that schrouderknits Joan has chosen to give so much to our community and hope you all enjoyed learning a bit more about someone who has contributed in such wonderful ways to Ravelry and the yarn world in general. By the way, clicking on any of the photos in this post will take you to project pages with notes that are as detailed and helpful as you could hope for! If you’d like to keep up with Joan, you can add her to your Ravelry friends, and look for updates on the main friends tab. If you have a Ravelry friend or someone you know is doing great things on our site, and you’d like to recommend we feature them here in the future, we’d love to hear!